A photo taken from a Norwegian surveillance aircraft shows Russian aircraft carrier Admiral Kuznetsov in international waters off the coast of Northern Norway on Oct. 17, 2016. A Dutch submarine on Nov. 9 morning tried to approach the Russian aircraft carrier group in the Mediterranean and spy on it, Russian Defense Ministry spokesman Igor Konashenkov said. "Earlier today, at 06:50 a.m. on Nov. 9 the search and attack group consisting of anti-submarine ships The Severomorsk and The Vice-Admiral Kulakov spotted a diesel submarine of the Dutch Navy (presumably Walrus), which had tried to approach the Northern Fleet’s aircraft carrier group for spying purposes." He said The Severomorsk and The Vice-Admiral Kulakov spotted the submarine that was 20 kilometers away at the moment using their standard hydroacoustics complexes and data obtained from anti-submarine helicopters Ka-27PL. "Despite the submarine’s attempts to evade surveillance a stable hydroacoustic contact was established with it. The ships kept track of the submarine for more than an hour and forced it to leave the area of the aircraft carrier group," Konashenkov said. "Such clumsy attempts to maneuver near the group of Russian ships might have caused grave navigation incidents." Konashenkov said. At the same time this episode allowed the anti-submarine forces of the Russian naval group to practice anti-submarine defense operations. The Northern Fleet’s task force left for the North-Eastern Atlantic and the Mediterranean on a mission on Oct. 15. 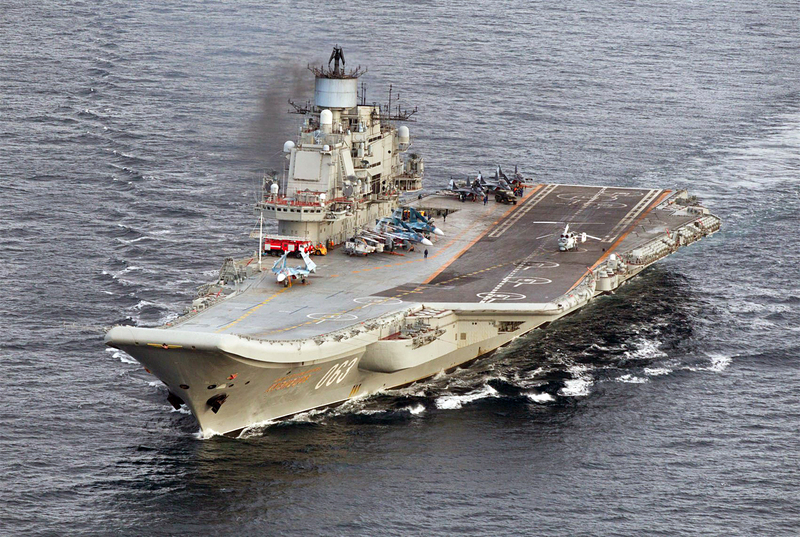 It incorporates Russia’s sole aircraft carrier the Admiral Kuznetsov, the heavy guided missile cruiser Pyotr Veliki, two anti-submarine ships The Severomorsk and The Vice-Admiral Kulakov and logistics ships.